Well, my copies of The Charmed Return have finally started arriving, so hopefully those of you who have also been waiting for the copies you ordered from bookstores will soon also get your copies. I don’t actually know why the books have been slow in getting out there - maybe it was jut a glitch at the warehouse? I’ve already had a lot of mails from people who have read the book and enjoyed it - thanks, keep them coming! I have also had a lot of people asking whether book 6 The Charmed Return really is the final book in the Faerie Path series, and whether there is any chance of a 7th book. In fact, Shannon posted a comment that as 7 is such an important number in Faerie, there should definitely be a 7th book - which makes a lot of sense. So, here’s the thing: I make my living from writing books, which means I need to know a publisher will want any book I have written before I can afford to take the time to write it. Harper Collins, the publisher of The Faerie Path series, originally asked for 3 books - the first trilogy that ends with The Sorcerer King/The Seventh Daughter. They were so pleased by how these were selling that they asked if I’d like to write another three. It took me about two seconds to say yes - especially as I had a further story in my head already, based on something that Queen Titania had said at the end of book 3. So far as I know, the books are still selling well, and I get fan mail just about every day, mostly from America, but also from Brazil, the Philippines, Australia , Germany and other countries. This is good news for me, but as things stand right now, Harper Collins, the Publishers, do not want a 7th book. The way I see it, there are only two things that will change their minds about this - one is that the first six books continue to sell well, the other is that fans of the series get together and ask Harper Collins for another book. If you people can convince the publishers to commission a 7th book, I’ll write it. And now to some very sad news indeed. 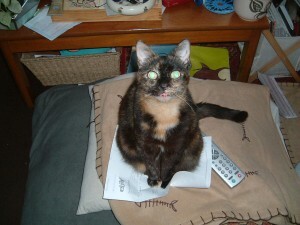 Those of you who visit this site regularly will have read about my cat Siouxsie. In fact, if you go back to my blog “Dinner With Siouxsie” last July, you’ll see a photo of her tucking into a plate of food I was eating. Well, I’m very sad to have to tell you that Siouxsie died last week. Claudia and I are bereft and devastated by this, as I’m sure you’ll understand. We had her for eighteen years and eight months, and for all of that time I have worked from home - so she has been a constant companion for me for a very long time - sleeping in her own chair by my side, or sitting on the desk watching me work, or marching unexpectedly over the keyboard so that a sentence I was writing ended up looking like tyojkeirghuwhseufbaushgnospfhlkmspdfgo2ut9widg! She often slept on the bed with us, and she would get me up at 4am every morning for her breakfast. I’d collapse back into bed after feeding her, and then she’s lie with me until about 7.30 when she thought I should get up. I’d wake up with her lying on top of me and patting my face with her paw to let me know she needed me to be up and about. The good news is that she did not suffer from a long and unpleasant illness - and we were both with her when she died quite peacefully in my arms. At the moment, we’re getting used to her being gone, and we haven’t rushed out to buy a replacement cat - after all, she wasn’t the kind of cat that can be replaced. I’m sure that we’ll get another cat or two eventually, but not straight away. I’m still trying to get used to her absence - I still look around to make sure there isn’t a paw or a tail behind the chair before I get up. After all, I’ve been doing that for years and years - it takes a while to adjust. So, goodbye Siouxsie. We will miss you more than we can say! On to some interesting and complicated new news! I’ve had a bunch of mails from fans of the Warrior Princess series, asking if there is going to be a 4th book in the series, and when it will be coming out. The news is good and not so good. On the good front, there is a 4th book and it has already been written. On the not so good front, the publishers Harper Collins have decided they do not want to publish it even though they asked me to write it. I’m told that many publishers are pulling back on their book list due to the economic climate right now - so I’m not the only writer in this position. On the much-better-news front, a British publisher has taken all four books in the series and plans to publish them in the UK over the next 18 months - so by Spring 2012, American readers will be able to get themselves a copy of the 4th book over the internet, even if they cannot just walk into a book store and pull it off the shelves. So - a delay of some months, but the book will be out there! But here’s where things start to get more complicated. The UK Publishers have decided they don’t want to call the series Warrior Princess. They are going to call it Destiny’s Path. (I bet many of you are really surprised that I don’t get a say in what a series of mine is called - but the bottom line is that although I’m asked for my opinion, the Publishers can call series and individual books in a series whatever they choose - within reason!) So, the UK editions of the Warrior Princess books will have the following titles: Book 1: Destiny’s Path, Rhiannon of the Spring. Book 2: Destiny’s Path, Govannon of the Wood. Book 3: Destiny’s Path, Merion of the Stones. Book 4: Destiny’s Path, Caradoc of the North Wind. And just to make it even more peculiar, the UK publisher is going to use a slightly tweaked version of the original Warrior Princess covers for their editions. Just to make things even weirder, let me try to explain the situation in Australia. The thing is that American books very often find their way into Australia, so the UK publishers decided to rush-release the first two books in the series in Australia, so that people would buy their editions rather than the American ones. However, at that time (last Summer, this was) the series was still going to be called Warrior Princess - but with sub-titles. So, book one in Australia, was Warrior Princess: Rhiannon of the Spring, and book 2 was Warrior Princess: Destiny’s Path. But now, when the series starts to be released worldwide in English, book one will arrive in Australia called Destiny’s Path: Rhiannon of the Spring, and book two will arrive called Destiny’s Path: Govannon of the Wood. I hope people are on the ball in Australia! I’ll blog more about the Destiny’s Path series as I get more information - but when I write about Destiny’s Path, remember I’m not talking about book two of Warrior Princess, I’m talking about the whole Warrior Princess series in the UK edition! Phew, I think I need to go and sit somewhere quiet for a little while now while my brain recovers. There needs to be a 7th book, they better let you write it! I am so sorry about your cat At the begining of January, we had to put one of our dogs down. She had liver cancer and she wouldn’t have made it another month and she would suffer. We had her for almost 14 years, it’s so hard. I know what you are going through, it does get a little easier. I’m so sorry to hear about Siouxsie! I have two cats of my own so I can imagine how terrible this is. I’m glad that she didn’t suffer and that she got to die peacefully in your arms-her favorite place, I’m sure. My sympathies to you and your wife. Allan first and foremost I would like to say how very sorry I am to hear about Siouxsie! I am so glad though that she didn’t suffer. I know words cannot ease your pain right now but you are in my thoughts and prayers. My sincerest condolences to you and your wife. As far as the 7th book goes in the Faerie Path series I will start bothering Harper Collins and hopefully Liz will have time here soon to get a facebook page going. I would love to see more than 7 but hey…one more would be better than none. I will also buy them all on my iPad if they are available in ebook format. I currently have them in hard copies. I look forward to reading some of your other series as well. By the way I’m a 42 year old mother and grandmother….to give you some insight which I’m sure you all ready know on the wide range of ages reading your books. i really really hope you get a 7th book published. i read the first book in a day!! it got so intense and good i couldnt put it down. i was in the middle of reading the 4th book, the immortal realm when i introduced the series to a friend. she had read all the way up to the immortal realm just as i was finshing the enchanted quest. in other words she read the whole series in the time i was done two of them. i dont know how they cant let you write a 7th one. do you have any ideas for it? 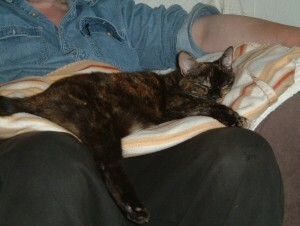 I’am terrible sorry to hear of the lost of your dear cat Siouxsie. I have had 7 cats throughout my life and I know exactly how you feel. My mother claims that after our cats past that sometimes they come to say a final goodbye in her dreams. Maybe you will be so lucky. In regards to the fourth book of the Warrior Princess/ Destiny’s Path could you please tell me which publishing company should I be looking to in the UK to purchase this book? In regards to the 6th book of The Faerie Path series. I have purchased my copy and sent a letter to the publisher in the hopes of more to come. I look forward to reading them on my break from University. Thank You so much for the vacation that I get while reading your books! I’m sorry about your cat. Would you ever think to write a story from a cat’s perspective? I’m so sorry to hear about siouxsie! The greatest gift a pet owner can receive in my opinion, is for a pet to go peacefully in your arms when the time comes. She obviously lived a very long and pampered life;) The poem “rainbow bridge” is great to read. AFJ. Thanks all of you for your kind words about Siouxsie. SM - I’ve never thought of writing from a cat’s point of view - an interesting idea, though! Shellee - yes, I knew the readership was quite wide-based age-wise. Last time I checked, only about a third of readers were 16 or under. Tessa - yes, I have some great ideas for book 7! Laura - the UK company publishing the Warrior Princess/Destiny’s Path is Hodder Children’s Books. I’ll obviously post more info closer to the publication dates. Sorry about your cat. It hurts to lose a good companion. But she is not 100% dead. She will always be in your memories and heart. But there should be a seventh book. Im really sorry about your cat i dont know what i would do if that happend to mine. there should be a 7th book i love the books and it would sad for it to end. the warrior princess/destinys path are awesome books, dont get why they would want to change the name. Really sorry to hear about Siouxsie. My dog died almost 5 years ago and I still feel the pain of the loss. Pets are family members without a doubt, my condolences. Im so terriably sorry to hear about your cat mr. jones! from reading your posts about her and knowing some about her persanlitly it mad me really upset to hear the news! just to let everyone that has a facebook i have created a page titled “Please make a 7th book in the Faerie Path series.” i know the title is kind of boring but it says what we want right? anyone that would like to join is free to mabye if we put enough posts on it then it will make a statement! Great liz! Thanks for posting. I’ll go join now. Well, if I can buy Warrior Princess/Destiny’s Path online, I guess that’s alright. Its a shame when that stuff happens though. I love that series, not quite as much as The Faerie Path, but still. Oh! And I’m sorry about your cat. Very pretty from the pictures. I’m sure she’s around you still though. I just finished reading the 6th book and I do hope you get your next book/idea published i’m looking forward to it if it does happen. I’m sorry for your Siouxsie I hope all gets better. Hi mr. Jones. Umm Id think it would be kinda unfair if you didn’t make a 7h faerie book seeing as he sixth one was a cliffhanger. If you were planning on making the sixth one the last one I would have liked to know what happened. So please do try. Now that you think about it, The syory was a cliff-hanger. There are a few question running in my head. I have a Q I just need to know will there be a 7th the faerie path books it took forever to get that last one in and then it left me with a not so satisfied feeling lol now come to think of it you planned it that way didn’t you? AFJ. Well, Dawnmarie - no, I didn’t really do that on purpose. I did actually include some explanatory stuff at the end of the original version of the book but the editors asked me to take it out. (No more details here - I don’t want to spoil the end for people who haven’t read it yet!) I’m going to give it a few more months, then if there’s no sign of a 7th book, I’m going to get people to ask me questions they don’t think were answered, and put together something to tie up all the loose ends. Does that sound fair? I think that sounds fair….but truthfully I would rather have the full 7th book so hopefully…..I guess we wait and see. i think thats fair and would be amazing! at least we would get something!!! mr. Jones,I’m so sorry to hear about your cat, I’m glad that she didn’t suffer, she was a beautiful girl by the way. I have 2 cats, 2 boys yaza and marley, 22 lbs each. I really hope they allow you to make a 7th book in the faerie path series, as you stated, 7 is an important number, especially cause it pertains to the series. how can i get in touch with them, and get a bunch of us to send them a message to allow you to write a 7th book? take care! AFJ. Sharon - thanks for your kind words with regards to Siouxsie. The address you would need to know for the publishers if you wish to write to them is to be found inside the front of the books - among the information on the page facing the dedication page. If there was a 7th book what will be the conflict or is plot ethier way what will Tania have to face this time the return of Gabriel Drake or will it be an issue in the mortal world maybe. It would be really cool to know the secret to immorality (hint hint). Another thing what will be the name the book? I finally got to this book (and finished, it took two days XD couldn’t put it down). Honestly I thought the ending was great. I would of liked to know a little more, but I don’t really find it a huge cliff hanger. It was almost the perfect ending, that leaves you thinking. Point: I liked it, and the ending. AFJ. T.K.B. - some nice ideas there! And, yes, what will any potential 7th book be called, I wonder? Maroon - thanks for that! There’s a review on Amazon.com saying the book was ruined by the ending - so I’m really glad someone thought I got it right! Gosh…I don’t think it was ruined. They need their head checked! lol It just leaves me wanting more..but hey…I could read book after book in this series. I’m trying to get some book review sites to take a look at the series. One I emailed so far is Bewitched Bookworms. It’s right up their alley. Hoping it will help with sales and hopefully get us one more book at the least. Thanks again Allan for such a wonderful series! I’m sorry about your cat. I’m reading The Charmed Return right now. It took me a while to get it, so I’m glad I finally did! Yuck, really? I don’t think the ending was ruined at all. I was like I said quite happy with it. Actually…all the books ended in great spots in my opinion. Well then…that was harsh I thought it was amazing my heart burst with joy and happiness because of the ending. I don’t think the ending ruined it. There needs to be a 7th book! I mean the end could be the end, but it keeps you thinking.. “oh, what happens next?” so it would be great if there was a 7th book. Mr.Jones, I’m quite sorry about your dear cat. I read the 6th Faerie Path book about a month ago and LOVED it!!!! I think the story isn’t done yet and there could be another twist in there. I also would love a 7th book maybe about Tania and the others a few years later. It would be so wonderful, I’m Faerie path’s biggest fan! i really enjoyed the ending! i wouldnt have changed it in anyway it gives the reader some chance to use their imagination. i dont like books that lay everything out step by step it takes the joy out of reading. also it doesnt compleatly cut you off from having anouther book it would be really counfusing to have and absolute ending and then write a new one you know? well i liked the WHOLE book! It’s been a while since the last blog post so I was just checking to make sure you were still alive out there some where. I’m sorry about your cat too. I wish I had a cat… Anyway, please don’t go into a sadness coma. I will miss your blog. Thanks! AFJ. Hello Sarah - it’s okay, we’re getting used to a home without Siouxsie - and I have her and her sister as my wallpaper on my computer, so I get to see a picture of her every day. The main reason I haven’t put up a new blog is that not much different has happened in the past few weeks - and lots of people have been asking the same questions - and I just thought it was easier to point them to the “most recent” blog. But don’t worry - I will definitely post another blog in the next few days. yo have to write 7 books for the faerie path!! and 7 IS very important because of tania!! PLEASEEE i loooove your books they are amazing. And about Siouxsie,i am sorry. Hope you feel better soon and make many more books!! you are like my role model! love you!! Hi, I chose “The Faerie Path” for an English project assignmt, I really enjoyed reading it. Part of the assgnmt requires us to write a letter, and mail it to the author. I have tried researching your personal address but was unsuccessful. The only address I found for you was that of your publisher’s. Is there a different one or should I use that one? Pls answer asap, My project is due soon. Thank you. AFJ. MF - thank you so much! 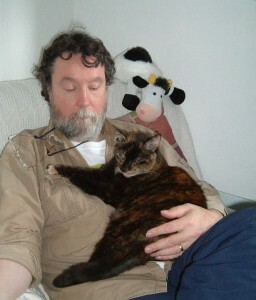 We are beginning to recover from losing Siouxsie, although a house without cats is still very strange. Cameron - I have just mailed you my address - it’s not something I really want out here on the Internet. If you don’t get my mail, write to me via the Contact page and I’ll send it again. I am so sorry to hear about your cat she looks really cute and kissable. I also have a cat which is very cute. I hope you do get book 7 of the fairy path series published. regards Brigitte.